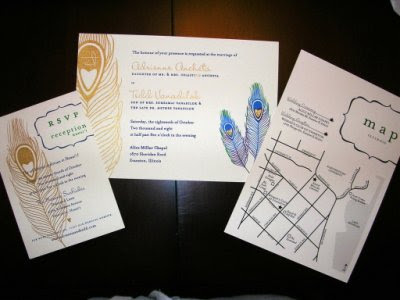 Weekend DIY for Adrienne & Tedd — Sweetchic Events, Inc.
Actually, I must give credit where credit is due - the map was designed by Tedd's twin brother Todd! 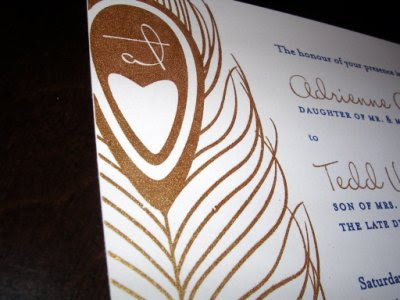 Note their subtle monogram, "at", tucked into the peacock feather... genius! 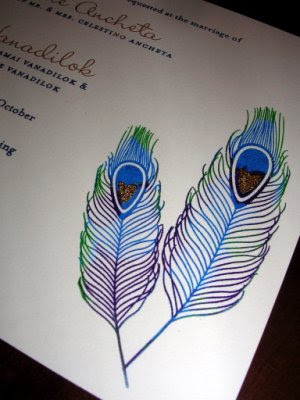 I helped Gocco these feathers... my first ever Gocco experience. And now for my Sunday accomplishments! These guestbook boards were made by following Mrs. Cupcake's awesome step-by-step instructions, thanks Cupcake! They were easy-peasy, albeit time-consuming (simply ironing the ivory fabric took almost an hour!). I incorporated the color scheme with my ribbon choices. Unfortunately I couldn't find the perfect emerald green, so I had to make do with the pale green. Luckily it still "goes", and I managed to find coordinating thumb tacks to keep the ribbon in place. There will be Hawaii and Chicago postcards for guests to sign/write messages on and tuck into the message boards. Why Hawaii? Because Adrienne is from Hawaii, lucky girl! Since they will have about 140 guests, I decided to make two boards in order to accomodate all of the 4" x 6" postcards. I am really excited by the two easels I found to hold them up. :) I also wrapped some Sharpies in coordinating ribbon (not shown)... Yes, I think I was having a bit too much fun today! My trip to Target netted me most of the items needed for their bathroom baskets. Does anyone else love the travel size section as much as I do?! For the gents, a slightly smaller basket with a first-aid kit, Alleve, Tums, cough drops, Q-tips, Shout wipes, lint roller, Scope, dental floss, and contact solution. The ladies have everything mentioned above along with some uhm, feminine products, hair ties, hair spray, clear nail polish, nail files, safety pins, and maybe a few other items I can't remember. Both baskets will also have mints. Stay tuned... Next weekend I tackle their Out-of-Town baskets!